Founded in 1987 by chef Mary Risley of Tante Marie’s Cooking School, Food Runners consists of more than 200 volunteers who pick up the surplus from 250 restaurants, markets, bakeries, and other food businesses in the city. Delivering produce as well as prepared items to soup kitchens and pantries that feed the hungry, the network moves enough food to serve an estimated 2,000 meals a day. 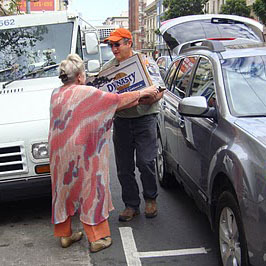 Every Saturday, Tuesday, and Thursday, volunteers from Food Runners make the rounds at the Ferry Plaza Farmers Market to pick up perishables and deliver them to shelters such as Next Door Episcopal Community Services, Raphael House Shelter, and Mary Elizabeth Inn, a residence for homeless and low-income women. 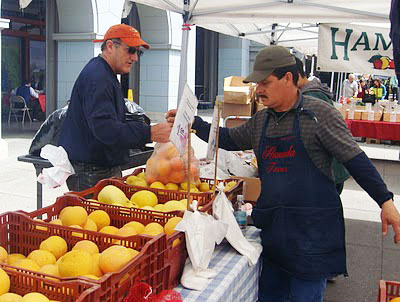 A dedicated Food Runner for 17 years, Goldstein started collecting the excess bounty at the Ferry Plaza Farmers Market the first year it opened. “I was shopping at the market, and it suddenly occurred to me that food was probably being left over,” he says. “So I just started showing up there with my pickup truck.” Goldstein now gleans as much as 2,000 pounds each week in the summer, and 500 pounds in the winter months. He says that many farmers are grateful not to have to truck the leftovers home, and some deliberately bring extra for him to pick up. A frequent stop on Goldstein’s route is Martin de Porres House of Hospitality in Potrero Hill, a longstanding collaborator with Food Runners. Described as a “free restaurant,” the volunteer-operated soup kitchen serves 300 to 400 meals a day to the needy, offering breakfast and a lunch of freshly made soup and salad to anyone who shows up on their doorstep. To learn more and find out how you can get involved, visit Food Runners, Martin de Porres, or San Francisco Food Bank. Photos courtesy of Food Runners.